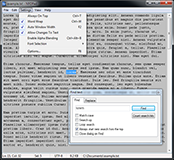 NFOPad is a small, fast and flexible text editor and nfo viewer. It is a clone of Microsoft's Notepad but much more customizable and with lot's of additional features yet maintaining the minimalistic look. 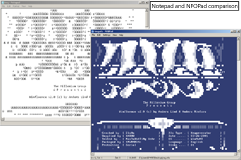 NFOPad also supports nfo files with ASCII art. The file extension is used to determine whether to use an ANSI or ASCII font. NFOPad also fully supports Unicode. 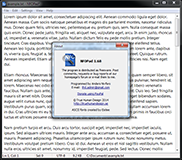 Program translations are made by users of the program. A big thank you goes out to the translators; Stefan S, Miguel Dias, Mauricio Cantún Caamal, Barnaba, tommili, Zilung, Klevest, 4Li, Bruno Leonardo, SzalayZ, Bogdan Donchura, Igor Rückert, Marco Tesseli, nickW, slavusec and IONIL. If you are interested in helping out with localizing NFOPad or have corrections please contact me. - Context menu renamed "View with NFOPad" -> "Edit with NFOPad"
- Quick switch between NFO/text mode can be done from menu or with shortcut keys. - More intuitive word selection when double clicking a word. - Adding ".LOG" at the top of a text tells NFOPad to automatically add the current date and time to the text upon opening, just as Notepad. - Recent files list always sorted so the most recent files are shown first. - Word wrapping added when printing to make sure all text fits the page. - Program settings can now be saved to an INI file or the windows registry. - Added a READ ONLY notification in the status bar. - "TXT file" is now shown in the Windows Explorer's New menu (can be turned off in Options). - Bugfix: fixed so force western latin encoding setting doesn't apply to unicode files. - Bugfix: Save As and changing encoding would reload the wrong file (file saved correctly but wrong text loaded). - Added option "Load NFO files with western latin encoding", true by default. NFO files was not displayed properly for users with a non latin OS language (such as Chinese or Japanese). - Search dialog has new settings for "always start from top" and "close on search"
- Added support for Vista/XP themes. - New ASCII fonts included for the nfo-files! Xml file with program specifications used by shareware sites, download here.